Spalding Nix Fine Art provides private clients with confidential, unbiased guidance on buying and selling fine art, antiques and collectibles in the global art market. We represent individuals, families, trusts, foundations and others in providing a wide range of art-related services. We also provides art selection/coordination services for corporate clients. We handle everything from research and discovery, to selection, to production and fabrication, to shipment and installation. Our corporate clients include companies like the Fortune 500 company Printpack. 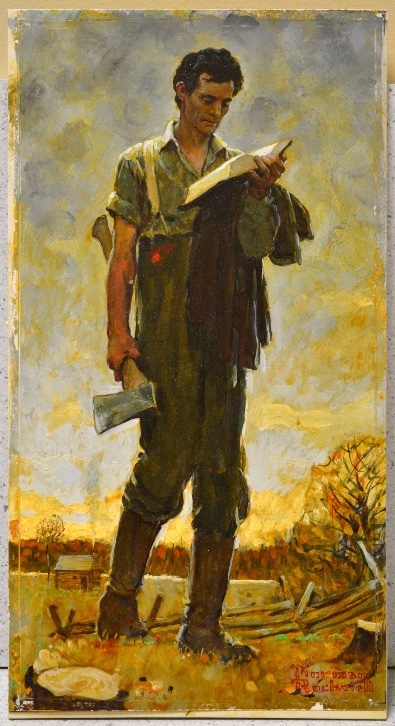 Spalding Nix advised in the authentication and sale of this recently re-discovered Norman Rockwell painting, selling at auction for nearly $50,000. Acquisition: Spalding Nix Fine Art advises private clients, foundations and corporations looking to initiate, build, or refine a collection. We develop personalized strategies to guide each client in navigating the complex network of dealers and auction houses. While advising on purchases, we work closely with each client to ensure that an informed decision is reached before selecting a work. Auction: Our professional background, experience and insider knowledge of the auction industry makes us well qualified to handle sales at auction on behalf of our clients. We undertake the management of consignment from the initial tentative auction estimate to the financial settlement after a successful sale. Our goal is to simplify the process, and to ensure that each client’s consignment receives the attention it deserves. Private Sales: Spalding Nix Fine Art is experienced in handling private sales in a variety of categories. We rely on our extensive network of contacts in the industry to determine the best strategy for the sale of your items. We will also research market conditions for a specific work of art or artist to determine if the timing of such a sale is appropriate. In addition, our firm has a proven track record in brokering art directly between private clients. Disposal: Spalding Nix Fine Art specializes in selling art and antiques on behalf of private collectors, family trusts, estates and corporations. Whether working with a single item or a large collection, we will devise a sales strategy to identify the appropriate marketplace, and ensure that each piece is correctly positioned to receive the highest visibility in the relevant market. • Assistance with conservation, restoration and framing. • Appraisals or sales advisory opinions. • Coordination of the authentication process. • Creation of a formal inventory database for a collection. • Referrals to insurance companies and home security firms. • Assistance with installation and museum loans. • Recommendations on art storage facilities and specialized art shippers.